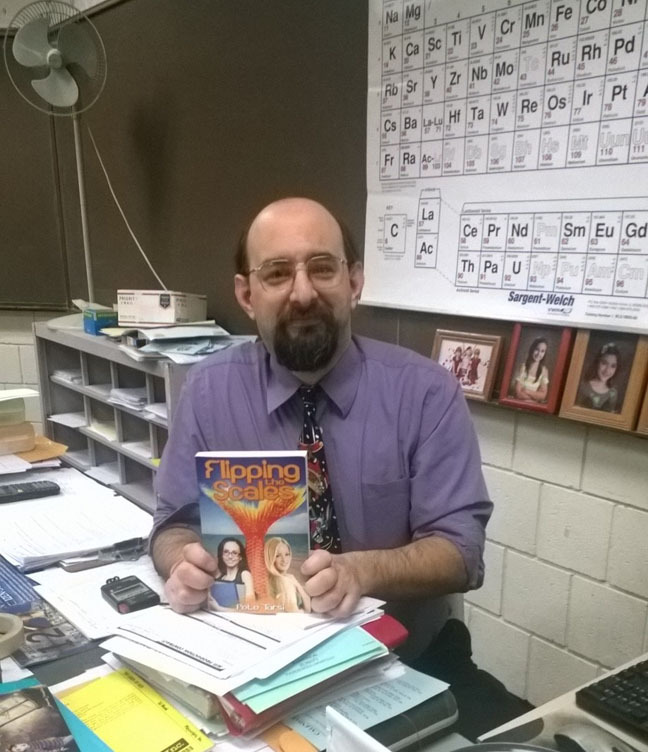 Attleboro High School (AHS) science teacher Mr. Pete Tarsi recently published the novel Flipping the Scales. The novel is targeted at young adults and is available at Amazon and Barnes and Noble online. Flipping the Scales follows the story of teenage girl, Meredith, and young mermaid, Marina, who switch lives. Meredith lives the life of a mermaid, while Marina learns what it is like to be a teenage girl, becoming more independent. As the novel goes on, things become a bit more complicated when the girls must change back before the next full moon. “I wanted to write something my daughters would enjoy,” said Tarsi, when talking about the motivation for his novel. The original draft of the novel was written last summer, but Tarsi recently had it published. He spent about a year looking for an agent and publishing company but it never seemed to work out. He sent in pieces of his story to agents and was constantly told the story was good but they couldn’t take it right now. “They weren’t really letting me into the party,” said Tarsi. Tarsi didn’t let the rejections get to him. “I understand it’s a business,” he said. Tarsi moved on to self publishing. When self publishing, the writer is responsible for marketing, the book art, and most importantly, having the book edited. Editing of the novel came from several different places. Tarsi turned to trusted college friends, fellow writers online, and other teachers. One of Tarsi’s most helpful editors was his friend’s teenage daughter, who is Tarsi’s target audience. The editors weren’t just looking for spelling errors, they were looking for continuity in the plot and whether or not the plot actually works. After finishing the editing process, Tarsi had to move onto the logistics of marketing the novel. He looked to the website Smashwords to distribute his novel online. The most notable companies distributed were Barnes and Noble and Amazon. Tarsi then had to self-advertise his novel. He used social media to really spread the word about his novel. Tarsi tried to find the right balance for a price for the novel. He wanted to be reasonable to readers but he also wanted to be taken seriously. He finally settled on an E-book price of $3.99. Overall, Tarsi believes the novel sales are better than expected. “I didn’t really have expectations going into it. So I’m happy with the sales so far,” said Tarsi. The physics teacher is currently working on the rest of his Flipping the Scales trilogy. He is in the process of editing the second novel, Skipping the Scales, and has the plot of the third novel in his head. This entry was posted in Entertainment, Home, In & Around AHS, Teen Interest and tagged 2014-15, AHS, Attleboro High School, Book, Flipping the Scales, Jonathan Kermah, Pete Tarsi on December 25, 2014 by abeeahs. With Christmas right around the corner, most males do not have a clue as to what to give to their significant other. Find the perfect gift for her by shopping for a Michael Kors’ item. Every adolescence girl is dying for the brand’s watches, purses and clothing. For those who don’t know the brand Michal Kors, it’s a New York City-based fashion designer widely known for designing classic American sportswear for women. “I’m obsessed with the Michael Kors collection. I bought a watch of his brand and I wear it every day,” said junior Lexi Barbosa. Michael Kors has been one of the most successful growth stories in the fashion business over the last several years, and the recent release confirms that the company is still performing extraordinarily well, especially around this time of the year. “I had no idea what I was going to get for my girlfriend for Christmas until my girlfriend started hinting to me that she wanted a Michael Kors’ purse for Christmas,” said junior Jason Rocha. Widely known for its price range, the brand’s website’s prices range from $24 (an IPhone 4 case) – to over $1,000 (suitcases). “Curious to see what the hype was about, I walked in and met a very energetic sales girl. She asked if I’d ever been to a Michael Kors store before, to which I replied that I hadn’t. I fell in love with their accessories at first sight,” said sophomore Idalis Fernandez. Michael Kors is among the most classic of American brands. Its simple, sporty, luxurious silhouettes are beloved by fashion lovers all over the country. “It’s a very pricey brand but it was worth seeing my girlfriend happy; she uses her MK bag every day,” said senior Juan Pablo Morales. This brand deserves five out of five stars for the perfect example of casual glamour that it represents. This entry was posted in Celebrities, Home, In & Around AHS, Opinion, Teen Interest and tagged 2014-15, Christmas, Christmas Shopping, Michael Kors, Rachel Oliveira on December 23, 2014 by abeeahs. As kids grow older, it becomes more difficult for adults to shop for gifts. Christmas is right around the corner and keeping up with today’s technology is becoming imperative for this generation. Telegraph is a website that allows anyone to look at the top best gadgets of 2014, most of which are already involved in our everyday lives. For $299 the Goji Smart Lock acts as a key, and with a simple tap of a Smartphone, any door to a house can be accessed. It takes pictures of activity present at entryway doors and can send real time picture alerts back to the Smartphone. For those interested in photography, Telegraph offers a few options: The Panono Camera Ball and the Android-based Socialmatic. 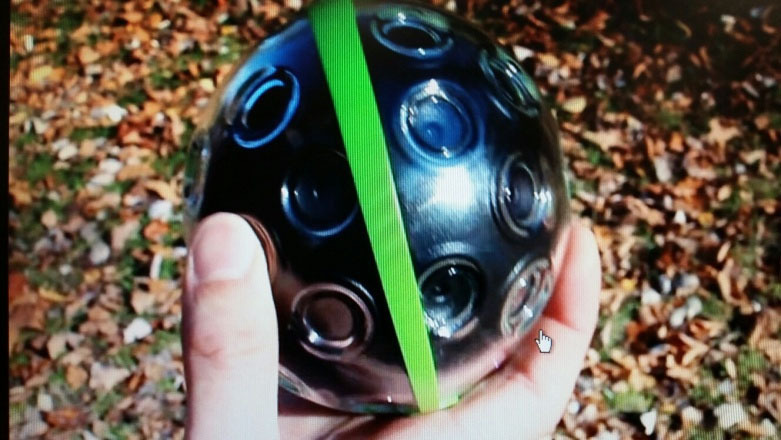 When the Panono ball is thrown into the air it takes 360 degree photographs from all angles. The Socialmatic is an inkless printing system that allows people to print stickers of their images and customize them. The retail price for the Socialmatic is $549. The Smart Watch, a more common gadget, links a watch to a cell phone. Once done, users are able to text, call, take pictures, view contacts, and tell the time, by looking down at their wrist. The great thing about these little gadgets is that they can be purchased at Bestbuy as low as $99. Another gadget is LG Home Chat, which offers texting inanimate objects such as a smart fridge or other smart appliance. There is no word yet as to how much this item will cost. For those who are prone to cavities, the dentist’s office and fillings may be a thing of the past. The world’s first enabled toothbrush, Kolibree, has been created. Kolibree monitors and compares a person’s daily brushing while recommending different techniques. The brush will retail between $99 and $200. The Livescribe Echo Smartpen allows its user to not only take notes, but to also record 400 to 800 hours of audio. The pen is rechargeable and prices start at $169.95. Telegraph, along with many other websites can easily be accessed on any computer. With today’s technology, there is something for everyone. Make a child’s holiday a great one by looking into some of this year’s newest gadgets. This entry was posted in Entertainment, Home, In & Around AHS, Teen Interest and tagged 2014-15, Best Buy, Christmas, Christmas Shopping, electronics, Kenna Beech, Telegraph on December 23, 2014 by abeeahs. 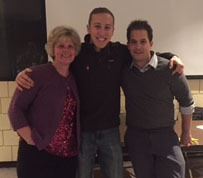 Attleboro High School’s (AHS) Gay-Straight Alliance (GSA) held their 17 annual “Safe School Symposium,” on Dec. 19, during all blocks except E, with speakers June Connors, Ethan Sobel and Kyle Megrath. “The symposium allows students to receive an outside point of view on the LGBTQIA+ (lesbian, Gay, Bisexual, Transgender, Questioning/Queer, Intersex, and asexual) community. It helps lessen stigmatization and promotes a healthy school system where, regardless of gender identity or sexual orientation, students feel both safe and sound through equality,” said GSA manager senior Tony Bollino. Last year, the speakers were the previous Executive Director of Greater Boston PFLAG Pam Garramone, Aliandro Brathwaite, Charles Meins, and Connors. Every year, GSA’s advisors Ms. Deanna Wells-Scott and Ms. Meredith Silva host this event in the mini-auditorium, and every year the event brings different speakers from Greater Boston’s PFLAG. They discuss myths regarding the GLBTQ community and share personal stories regarding their experiences. They hope to create a safe school community. “We think it (the symposium) provides a unique perspective within the community and humanizes LGBT issues by putting a face on them. It promotes diversity with people who can share firsthand account experiences from within and outside the school,” said Silva. The symposium consisted of a “stand up, sit down” game where Megrath would say a statement, and the audience would stand up if that statement applied to them. The speakers then went on to tell their own personal stories. The first speaker was Connors, who spoke about her son coming out to her family as gay. She talked about how supportive everybody in the family was of him, and said that if somebody thinks it is time to come out, they need to take their safety into account before anything else. “Safety is number one. You have to feel safe with the person you’re telling. Remember that everybody comes out in their own time,” she said. The second speaker was Sobel, who talked about his own experiences before and after he came out to his family and friends. He explained that stereotypes are not always accurate and nobody ever knows who could be gay. “It’s being an athlete and being gay for me,” Sobel said about breaking stereotypes. The third and final speaker was Megrath, who is an ally of the LGBT community. He is the Greater Boston PFLAG’s program manager and has worked on marriage equality campaigns in states such as R.I. and Ind. AHS’ symposium was Megrath’s first time speaking about his experiences as an ally. After they each told the crowd their story, the speakers had the audience do an activity called “Head, Heart, Hand,” which asked everyone to write down one thing they think, one thing they feel, and one thing they are going to do to help those in the LGBT community gain acceptance. Health teacher Ms. Amy Delgado’s thought was that the GSA did a great job with the symposium, and that more people should be aware of acceptance. Her feelings were that her seniors were very respectful during the symposium by participating and being understanding. She said that she will always make sure her classroom is a safe zone and will help spread awareness in her classroom. The symposium is an important building block toward equality within the school system. The Greater Boston PFLAG is located at 85 River St., Suite 3A in Waltham, Mass. Their helpline is 866-427-3524. This entry was posted in Clubs, Events & Activities, In & Around AHS, Personal Stories, Teen Interest and tagged AHS, Attleboro, Attleboro High School, Ethan Sobel, GSA, GSA Symposium, June Connors, Kyle Megrath, PFLAG, Safe School Symposium, Taylor McKenna on December 23, 2014 by abeeahs. The holidays can sometimes be difficult when trying to figure out the perfect gift for friends, family, or that special someone. The Attleboro High School (AHS) greenhouses had teachers and students covered. 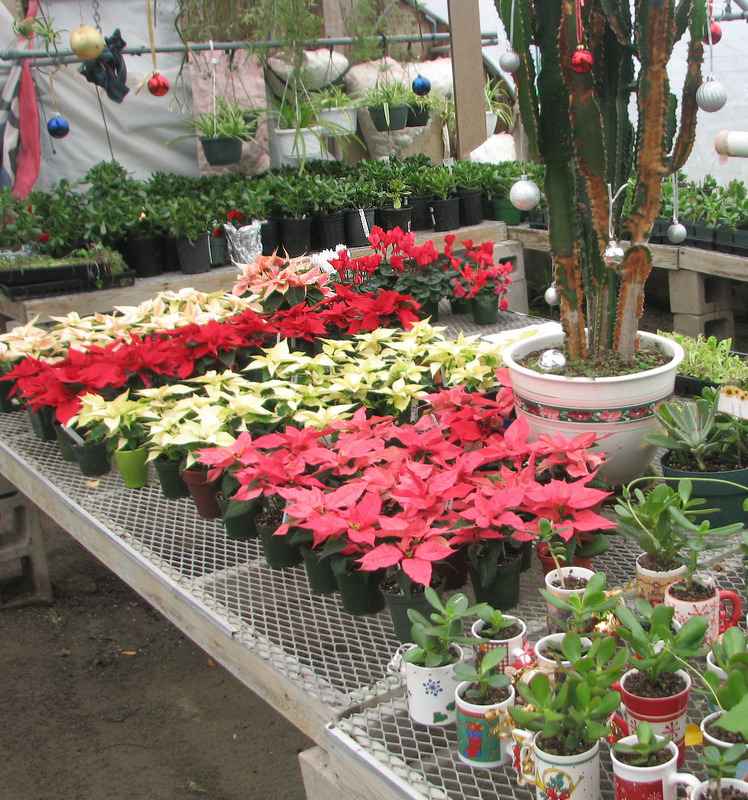 “Absolutely a great gift for anyone during the holiday season,” said AHS teacher Mr. Gregg Finale, who has spearheaded the growth and sale of holiday plants this year. Finale had students from the special education class and his Botany class help handle upkeep and sales. Bought wholesale, the plants were in different stages of growth and were appropriately priced between $2 and $16. Finale sent out students to sell in the halls of AHS, during B block. During one of the days the cart made $90, while on another it made $60. “The cart has sold approximately 40 plants,” said AHS senior Brandon Massey, a student who often sold from the cart. Massey also said how polite the other students were to the teachers at AHS. “When entering a class we knock first and ask for a moment of their time before offering the plants for sale,” he said. “We hope to sell out by holiday break, but we’ll probably stop selling on Tuesday,” said Finale. “Poinsettias are broad leafed plants with very vibrant colors that stand out very well as living holiday decorations. Cyclamens are excellent, long blooming houseplants, valued for their up-swept petals. Zygo cactus is a flowering cactus that will flower every year indoors. Amaryllis is a winter flowering house plant, known for large beautiful flowers, which are commonly white with crimson veins. They can also have pink and purple instead of crimson,” described Finale. “All of these plants are toxic if ingested and should be kept away from anything that may eat them,” warned Finale. None of the four plants should be watered on their petals or colored leaves; too much moisture on them will brown the leaves/petals and make the plant less appealing. Students delivered large orders to a customer’s vehicle if requested. All proceeds went to the Farm to Table Initiative, which is a program where fresh greens are grown at AHS and then prepared in culinary. This entry was posted in Clubs, Events & Activities, Home, In & Around AHS, Teen Interest and tagged 2014-15, AHS, Attleboro High School, Charley N. Jones, Greenhouse Gifts, Holidays on December 23, 2014 by abeeahs. 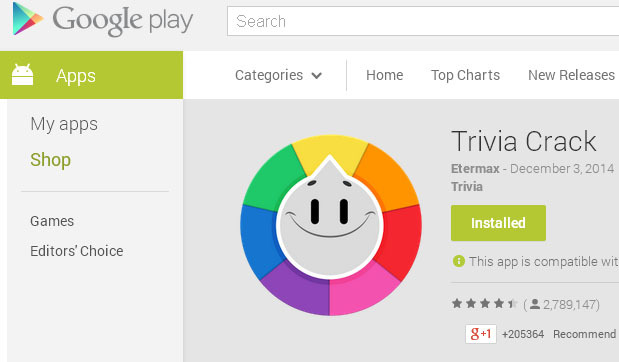 The latest craze, Trivia Crack, is a free App, which is available for download at the Apple App and Google Play stores. It was developed by Etermax, a Latin American company. Trivia Crack is available in many languages, including: English (U.S. and U.K.), Spanish, Portuguese, French, German, Italian, and Catalan. It allows people to challenge each other in a trivia game similar to Jeopardy. Users can play a random opponent, connect to Facebook, or send an invitation to someone, which allows play with friends who also have the App. There are six categories: Science, History, Entertainment, Geography, Sports, and Art. Each category contains questions that test the user’s knowledge of that particular subject. The player spins the wheel and answers a question from whichever category the spinner lands on. If three questions in a row are answered correctly, the player has the opportunity to win a character. There is also a crown spot on the wheel and if a player lands there, they can immediately answer a question for a chance to win a character. They can either challenge the person they are playing for one of their characters, or simply answer a question in a category of their choosing. A challenge is six questions, one from every subject, and both players have the chance to answer the same questions. Whoever answers the most correctly, wins the challenge and secures a character. The characters determine who wins the game; the first person to collect all six is the winner. Trivia Crack is incredibly addicting and fun for all ages. For these reasons, it deserves four out of five stars. This entry was posted in Entertainment, Home, Opinion, Teen Interest and tagged 2014-15, app, app review, Apple App Store, Google Play Store, review, Rose McDermott-Pinch, Trivia Crack on December 23, 2014 by abeeahs. Once again Attleboro High School’s annual Winter Concert is here, offering the music department a time to truly shine and show that their musical ability has only been growing. “The concert has improved since last year and that was an improvement on the year before that,” said Band President and Attleboro High School (AHS) junior Brynna Turner. “We give very diverse music and everyone seems to enjoy what we’ve worked on for so long,” said AHS junior and Vice President of Mixed Chorus Sam O’Donnell. With great hits like those from years past, it’s no wonder students and performers are so excited to experience this one. The President of Mixed Chorus, AHS senior Shannon Fisk, went so far as to say she is “stinkin’ excited” for their performance this year. The concert will include all four of the music department groups: Concert Band, Jazz Ensemble, Select Choir, and Mixed Chorus. The number of students performing in the concert according to Choral Director and AHS music teacher Mr. Gary Hyman is over 100. Performers are expecting a fairly large turnout. Turner said they were expecting “about half” of the 1,253 seats to be filled on the night of the performance. The group will perform the classics, “The Nutcracker,” “Twas the Night Before Christmas,” and “Sleigh Ride” and will even be putting on an audience sing-along. Attendees should not forget to watch for their surprise guest. “The group is very dedicated and more talented and with better dynamics than last year,” said O’Donnell. The Concert at the Robert H. Bray Auditorium will be on Thursday, December 18, at 7 p.m. at Attleboro High School, 100 Rathbun Willard Drive, in Attleboro, MA. Admission is free, but donations are warmly accepted. The suggested donation is $3. Any additional information can be acquired from Hyman at 508-222-5150 extensions 1256 or 1181. This entry was posted in Entertainment, Events & Activities, Home, In & Around AHS, Teen Interest and tagged 2014-15, Bray Auditorium, Charley N. Jones, Winter Concert on December 16, 2014 by abeeahs.